Currently, we are assisting both primary and higher secondary schools in southern India. The schools are listed below, along with links to photos and videos. 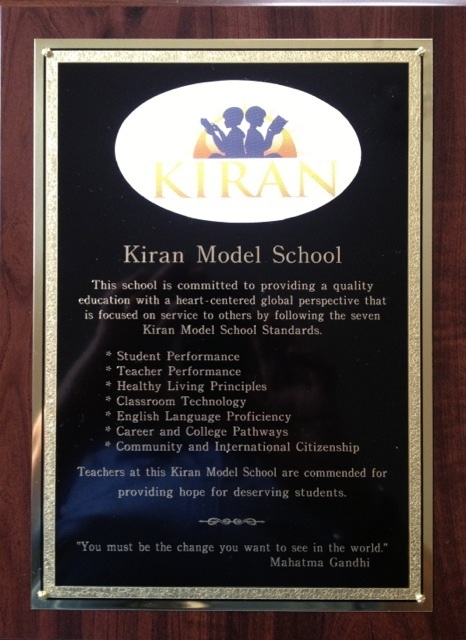 Kiran Charities require all schools that are recognized at Kiran Model Schools to adhere to high standards. The plaque at the left is used to recognize each school that agrees to strive to meet these standards. The seven "pillars" represent a blueprint for success. Kiran Charities provides both oversight and support for all Kiran Model Schools as they strive to achieve and maintain these standards.